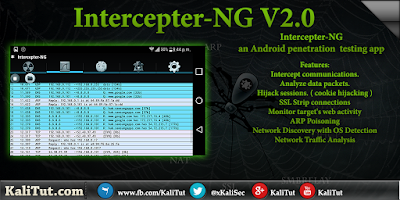 Intercepter-NG v2.0 is an Android penetration testing app. 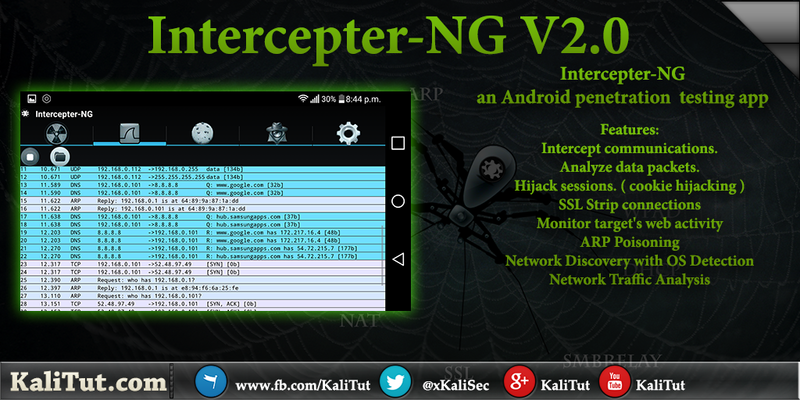 by using Intercepter-NG you will be able to intercept and analyze un-encrypted communications over WiFi network. Intercepter-NG is a network toolkit for various types of IT specialists and an easy-to-use application to intercept communication. Session hijacking, also known as TCP session hijacking and cookie hijacking , is a method of taking over a Web user session by surreptitiously obtaining the session ID and masquerading as the authorized user. ARP stand for “Address Resolution Protocol” this type of attack sends falsified ARP messages over a local area network to link the attacker MAC address with the IP address of a legitimate computer or server on the network. 2. Install and open the app click on the Radar icon in the upper left corner of IntercepterNG. Now tick the check box of Save pcap session and change the memory location to SD Card if you want the file to be saved on your SD card. 8. Click the cookies icon and wait for the cookies to load then select any one of the IP shown it will load the web page your victim are in. Tested on 4/5/6/7 Android. Should also work on 2/3. 2. Interception of traffic through MiTM attacks. Scanning mode is active by default after starting tool. PS: Don't forget (!) to install SuperSU and BusyBox! + Smart Scan: NBNS + Bonjour resolve + hostnames cache. + Bruteforce mode: SMTP TLS, POP3 TLS, TELNET and Single Mode. + New certificates generation algorithm. Completely new [Android Edition] ! New Intercepter Console Edition is available now. It works on any *nix including IOS and Android. Special thanks to nimmox for testing and building android version. +New SMBRelay MiTM with NTLMv2 support (watch video tutorial). +NTLM Challenge+Response grabbing (NTLMSSP). Bruteforce it with C&A. +New WPAD MiTM (watch video tutorials). Next generation of Intercepter has come. Besides a new GUI, countless improvements have been made. The whole process of MiTM attacks is now completely automated.